Lessons from the modern history show that visionary policies and rapid technological change can achieve agricultural productivity growth and poverty reduction. However, lessons from the past are not sufficient to motivate action in today’s world. The grand modern challenges, such as climate change, soil degradation, and growing competition for land and other resources add more layers of complexity to decision making and require rigorous analysis of the decisions’ potential outcomes. PIM’s Flagship 1 Technological Innovation and Sustainable Intensification assesses alternative scenarios for future food security to identify their inherent challenges, analyzes technological solutions that could address those challenges, and examines the associated public policies and investments in science and innovation required to implement the solutions. 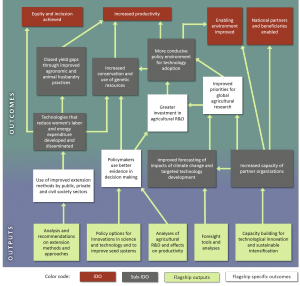 What are the key socioeconomic and biophysical drivers of change in agrifood systems? What challenges do these drivers present to achievement of sustainable food and nutrition security at global, regional, and national scales? How can agricultural technologies, natural resource management practices, and infrastructure investments address these challenges in ways that manage trade-offs, protect natural capital, and sustain the provision of ecosystem services? How do investments by governments, the private sector, and other nongovernmental actors in agricultural research and development affect agricultural productivity growth and poverty reduction in developing countries? What are the implications of these investments for outcomes in developing countries and for the global agrifood systems? 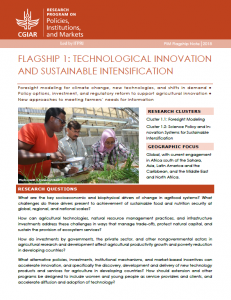 What alternative policies, investments, institutional mechanisms, and market-based incentives can accelerate innovation, and specifically the discovery, development and delivery of new technology products and services for agriculture in developing countries? How should extension and other programs be designed to include women and young people as service providers and clients, and will greater inclusiveness accelerate diffusion and adoption of technology? This flagship takes a global perspective that transcends a single crop, commodity, technology, or agroecological system. Applications of the scenario analysis and work on innovation systems are regional and national, with current engagement in Africa south of the Sahara (Benin, Botswana, Burkina Faso, Cote D’Ivoire, Ethiopia, Ghana, Kenya, Malawi, Mali, Niger, Nigeria, Senegal, Tanzania, Uganda, Zambia, and Zimbabwe), Asia (Bangladesh, China, India, Indonesia, Laos, Myanmar, Nepal, Pakistan, Philippines, Thailand, Vietnam), Latin America and the Caribbean (Brazil, Colombia, Nicaragua, Peru), and the Middle East and North Africa (Egypt and Tunisia). The global perspective of Flagship 1 allows CGIAR and global partners to assess priorities over a horizon of several decades, and to position work accordingly. 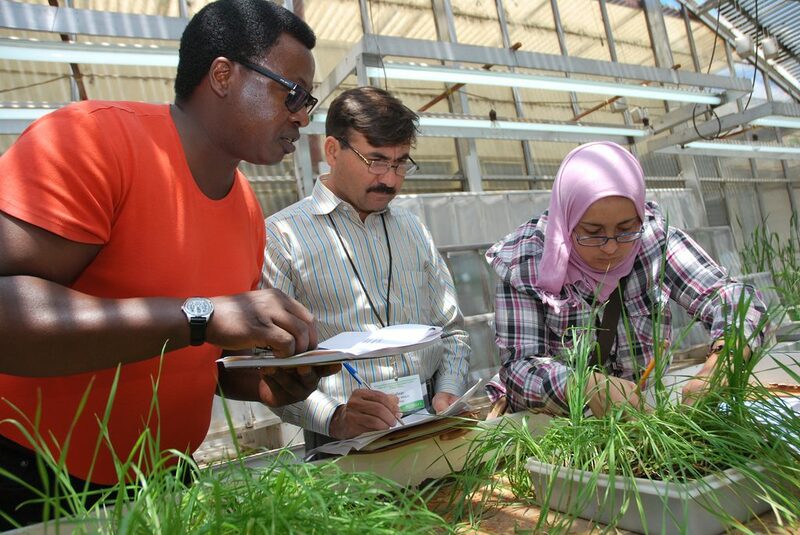 National applications allow national leaders to see scenarios for their own countries in a regional and global context, to identify priorities for national agricultural research, to assess the level of investment in agricultural research required, and to consider institutional reforms that will allow investments in science to earn high returns. A few well-established projects and programs led by IFPRI and external partners are part of PIM within Flagship 1, including Agricultural Science and Technology Indicators (ASTI), Global Futures and Strategic Foresight (GFSF), HarvestChoice. Global, with current engagement in Africa south of the Sahara, Asia, Latin America and the Caribbean, and the Middle East and North Africa.